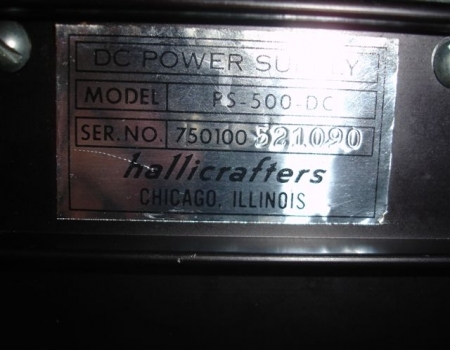 The Hallicrafters PS-500-DC power supply is a complete, self-contained power unit designed to permit the Hallicrafters SR-400A transceiver to be operated from a 12 volt DC source. This power supply is designed for operation in conjunction with a negative grounded power source. 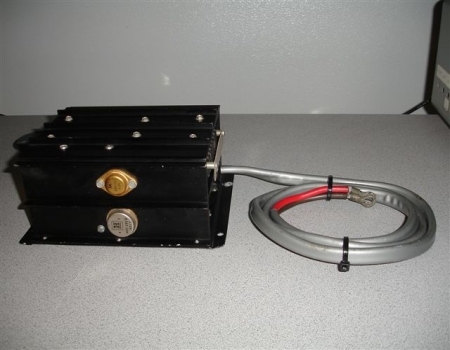 This power supply will operate from an 11.6 through 15.6 volt DC source with 13.6 volts as nominal voltage. All connections are made to the power supply through a two conductor cable and terminal strip on one side of the unit. 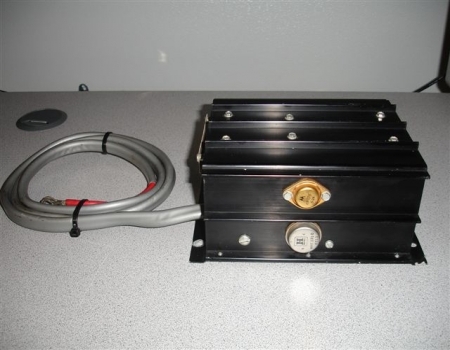 The two conductor cable is used for the connection to the 12 volt source through the factory supplied wires. The seven connector strip is used to supply the operating voltage to the transceiver and connects to the transceiver through the factory supplied cable that is included on the MR-400A mobile mounting rack. These next two photographs show both the left and right sides of this power supply. 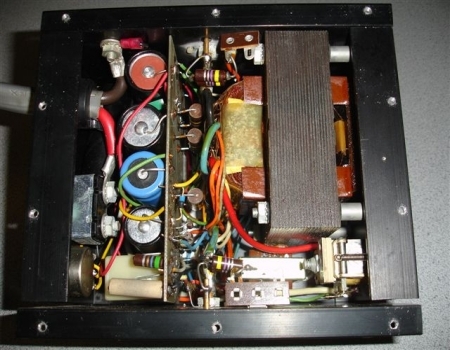 The round silver item at the bottom center of the power supply is a transistor and the gold colored item slightly above it in the TO-3 case style is a 2N176 transistor with a date code of 5-24(24th week of 1965). Both of these 2N176 transistors on each side of this power supply have the same date code on them so there is a good chance that both are original or both were replaced at the same time in the past. 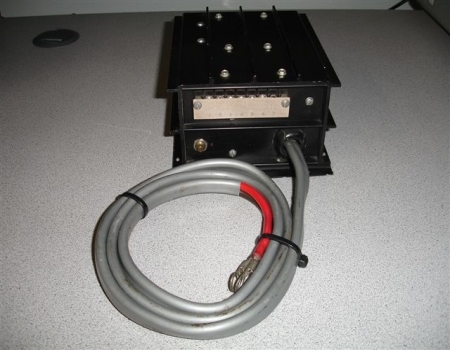 The photograph on the left displays the two conductor cable that is used to connect to the 12 volt DC power source. 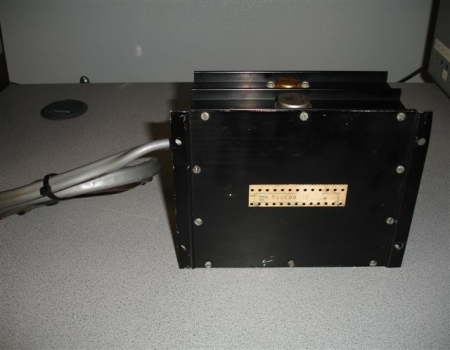 This picture also shows us the seven connector strip which is used to supply the operating voltage to the transceiver. 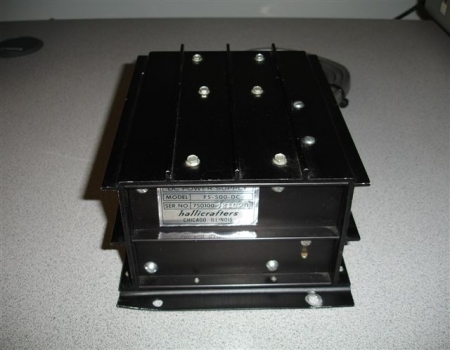 The picture on the right is of the metal Hallicrafters label that identifies the power supply with both a model number and serial number. 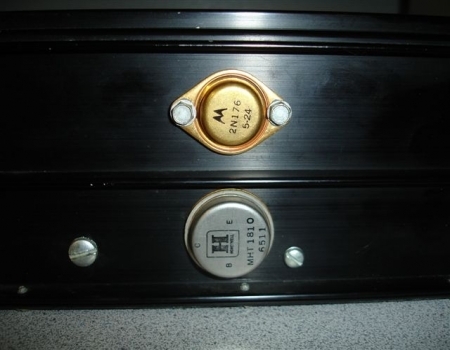 The photograph on the left is a close up of the two transistors that are located on the side of this power supply. The power supply has a pair of these transistors located on each side. The photograph on the right is a picture of the power supply with the bottom cover removed.